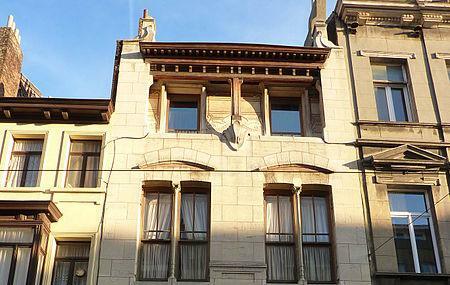 Victor Horta built this house for his friend Eugene Autrique in 1893. It was the first townhouse in which he applied Art Nouveau techniques. Budget constraints mean that he could not fully unleash his creativity. Architecturally this makes the house very interesting as it perfectly represents the dawn of the Art Nouveau era in Brussels. Still, the usual elements of the style - wrought iron, sgraffito, floral motifs and use of natural light - are all present, if constrained. And the interior is still quite impressive, lavish with ornamentation and decor in the vestibule, staircase and dining and living rooms. This despite Autriques admonishment that the house be kept as simple as possible. Guided tours need to be booked 2 weeks in advance. The house may be closed for renovation and maintenance from time to time. A beautiful and haunting space to walk around. Playful installations to evoke dream-like experiences were an unexpected bonus. I was the only one there during my visit which added to the eerie atmosphere. Nice setup from Schuiten and Peeters in a beautiful house. It feels comfy, a must do short visit when in this area of Schaerbeek!! Beautiful example of an Art Nouveau house (Victor Horta's first townhouse in fact) that I would recommend visiting during the week, it was completely empty. I thoroughly enjoyed my visit and wouldn't mind returning to enjoy its beauty again! Great place to visit. Takes you back in time. Don't forget and visit the attic. Really interesting place. The exhibition was great.